A scroll compressor works by using two interleaving scrolls, meaning one scroll within the other, to compress fluids, in this case refrigerant. Scroll compressors are known for operating more quietly, smoothly and dependably than many other kinds of compressors. 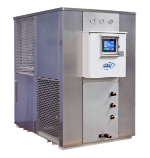 In the case of water-cooled chillers, scroll chillers usually have multiple compressors in one or two refrigeration circuits. Control is established by staging the compressors. They come with several components, such as: starter/control panels, drain valves, flow switches, electronic expansion valves, brazed plate evaporators, air-cooled or water-cooled condensers, subcoolers, interconnecting piping and (optionally) partial heat recovery. Compact, they usually accommodate smaller systems, used commercially for systems with less than 30 TR capacity, and can be designed for outdoor use or industrial indoor use. Industrial-grade scroll chillers are ideal for use in air conditioning large office buildings and other commercial and industrial facilities. They are also good for such applications as low temperature processing, heat recovery, thermal storage and ice-making. Engineers recently modified scroll chillers to enable them to run at part load capacity with a single compressor. Before, they were only able to run at full capacity without human manipulation outside of the powered machine. An advantage of scroll chillers is their energy efficiency. They are also becoming more environmentally friendly, as many companies seek to reduce use of refrigerants with high Ozone Depletion Potential (ODP). Scroll chillers are also easy to install and easy to maintain, and they can be customized to a variety of energy, mechanical and sound configurations. With this customizable sound capability, they work well in sound sensitive environments. Because they have fewer moving parts than, for example, reciprocating chillers, scroll chillers theoretically boast greater reliability. Scroll Chillers Scroll chillers are a type of chiller, which is a system that cools water for the purpose of cooling, humidifying or dehumidifying the air. Most often, they are used in air conditioners. 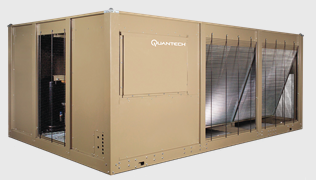 A scroll chiller can be air-cooled or water-cooled, and is often self-contained. "Scroll" refers to the type of compressor that the chiller uses, which is also sometimes referred to as a spiral compressor, a scroll pump or a scroll vacuum pump.